“How can I recover accidentally deleted text messages from my Samsung Galaxy S8? Please help!” A question asked by James Wood in an Android forum. As times goes on, people’s communication mode has changed a lot, and a variety of instant messaging software has emerged in endlessly. However, SMS is still one of the most commonly used methods. According to statistics, millions of text messages are sent and received by short message service (SMS) on Android mobile phones every day. However, for some artificial or non-artificial reasons, such as deletion, software crash, system error, etc, the SMS messages may get lost. It would be a nightmare when there are important information in it. Don’t worry. Hereon, we’ll share you how to retrieve deleted text messages on Android. Note: When you find text messages were deleted or lost from Android device, please stop using the device and recover lost SMS messages with a professional Android SMS recovery tool as soon as possible. Gihosoft Android Data Recovery offers an easy way to retrieve your deleted or lost text messages from all kinds of Android smartphones and tablets, like the latest Samsung Galaxy S9/s9+/S8/S8+/S7/S7 Edge/S6/S6 Edge/Note 8/Note 5/J7/J5, HTC U11 , LG V30, Google Pixel/XL, Motorola, Sony, Huawei, OnePlus, ZTE and many more. Please download the Android SMS Recovery software and install it by following the setup instruction step by step. Step 1. Start the Android SMS recovery software on your computer. Enable USB debugging on your Android and connect it to the computer via USB cable. Step 2. Start scanning files on your Android device. The scanning process will take a few minutes that it depends on the file quantity stored on your Android device. Step 3. Preview and recover deleted text messages on Android. All the scanned files such as text messages can be previewed with details like person name, phone number, messages content, date and specific time. 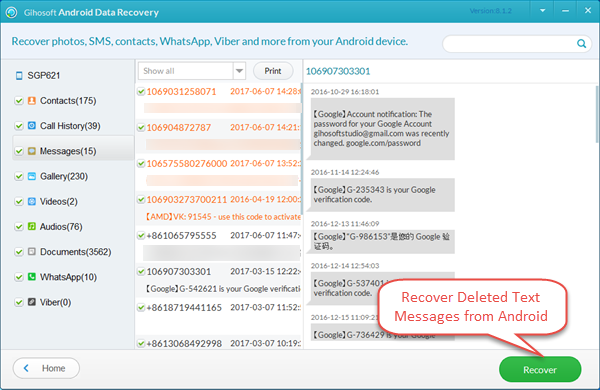 Except for restoring deleted and lost text messages on Android, this software can also enable you to recover Android deleted WhatsApp, Viber, contacts, photos, videos, and more files. How to Keep Android SMS Messages Safe? When there are various reasons such as rooting, unintentional deletion, virus infection, factory setting restoration and other unknown factors that can cause Android device files loss, maybe backing up Android SMS messages is the best way to keep your important data safe. You can try an Android message backup app like SMS Backup & Restore which is free to download on Google Play. Or you can use Android File Transfer software to transfer Android text messages to the computer. When your text messages get lost or deleted, you can restore deleted text messages from Android backup quickly.